I feel moved to write about Bitshares...... again. One of my new favorite uses of the DEX is to exchange other crypto to move Steem into and out of my Steemit account. I used to use BlockTtrades, but I find it much cheaper to use the DEX directly. One of the cool things about the bitshares DEX is that other instances of whole exchanges use the same exact based Graphene blockchain to run the trade engine. Examples of this are Rudex, CryptoBridge, BitSparkDEX, OpenLedger, and EasyDEX. I think there are others I'm missing too. When you join one, you can automatically log into the others using the same *.bin key or brain wallet. Each exchange has it's own token that gets used to add value to the exchange. The original Bitshares DEX uses bitshares, SparkDex uses zeph, Openledger uses one that I don't recall. Each do a slightly different thing, so for example, Bitspark's genius is that they focus on the remittance industry in Asia and Africa and have tailored the exchange around that. One really interesting thing is that there exist arbitrage opportunities between the exchanges on assets like Bitcoin, Dash, etc. I haven't figured this out how to profit from this yet, but can only imagine that it is a huge opportunity. It trades around 1:1, but sometimes it goes above or below based on demand- That's where the pennies can add up if you have a trading bot that can do that. The whole reason I'm powering down out of my Steemit wallet is that I'm trying to pay off a loan I took in Chinese Yuan. 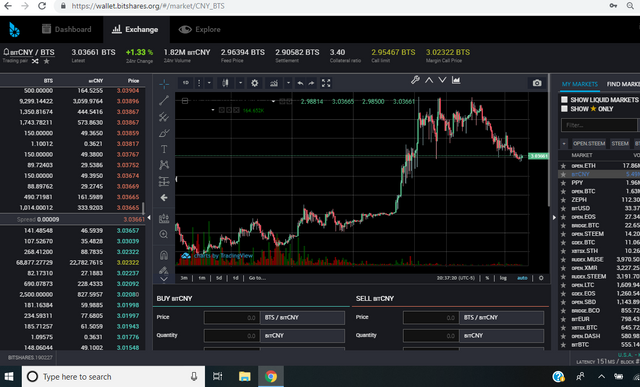 I'm also trading my way out of it- buying bitCNY low and selling it higher for a profit- So far so good. There's a part of me that needs to better understand what all these Bitshares based DEX exchanges do, and how I can help others use them to exchange their crypto with the safety and security of the DEX- I so don't trust Bitfinex, Binance, and certainly not Coinbase! Very useful and information regarding bitshares and DEX, how is trading going? It seems that everything is turning into green pastures and that will probably start some mid and long term investment opportunities. Congratulations! This post has been upvoted from the communal account, @minnowsupport, by jrb450 from the Minnow Support Project. It's a witness project run by aggroed, ausbitbank, teamsteem, someguy123, neoxian, followbtcnews, and netuoso. The goal is to help Steemit grow by supporting Minnows. Please find us at the Peace, Abundance, and Liberty Network (PALnet) Discord Channel. It's a completely public and open space to all members of the Steemit community who voluntarily choose to be there.